“`Star Wars creator George Lucas was on the side of the City of Angels, choosing Los Angeles as the home of a museum, which will showcase his life’s work, along with a major collection of exhibits on film history and art. Organizers announced the Lucas Museum of Narrative Art will be built in Exposition Park, where it will sit alongside the Natural History Museum and the California Science Center, which houses the space shuttle Endeavour. “`Lucas has been trying to build the museum for nearly a decade, and is financing the project by himself with plans to spend over $1 billion. It had several possible locations, but the choice came down to rivaling Northern and Southern California. San Francisco was offering Treasure Island, with its scenic views of the bay, as a home that the museum would have virtually to itself. “`The museum will house Lucas’ personal collection, which includes about 40,000 illustrations, paintings, and movie-related items, including storyboards and costumes from The Wizard of Oz, Casablanca, and of course, Star Wars. 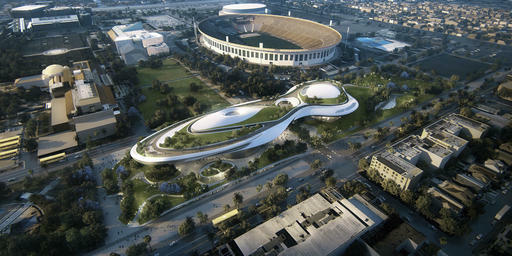 Los Angeles Mayor Eric Garcetti emphasized that it would not be just a Star Wars museum. “`Los Angeles seemed an obvious choice for Lucas, not just because of its film industry legacy. He is an alumnus and a major donor to the film school at University of Southern California, which is across the street from the museum site. However, he has strong San Francisco ties as well. He lived in the Bay Area for most of his adult life, and was the home for Lucasfilm, until the Disney Company bought it in 2012. “`Garcetti said Exposition Park will allow museum-hoppers to see a movie-magic spacecraft, and then walk over to see the real thing: the space shuttle. The location is also is home to the Los Angeles Memorial Coliseum, where USC Trojans and Rams play football, and a stadium for its new Major League Soccer team is currently being built. A light rail line that opened last year connects the park with downtown Los Angeles and the beaches to the West. “`This makes Southern California the definitive base of the Star Wars franchise, with Disney having bought the rights to the franchise, and now, building a Star Wars-themed land within its Magic Kingdom in Anaheim. This entry was posted on Tuesday, January 10th, 2017 at 1:35 pm	and is filed under Blog by Manny Pacheco. You can follow any comments to this post through the RSS 2.0 feed. Responses are currently closed, but you can trackback from your own site.